I have a new neon orange helmet. It is great to have this new type of race offered by MBAA. I will be there on August 27th for sure. Interesting. 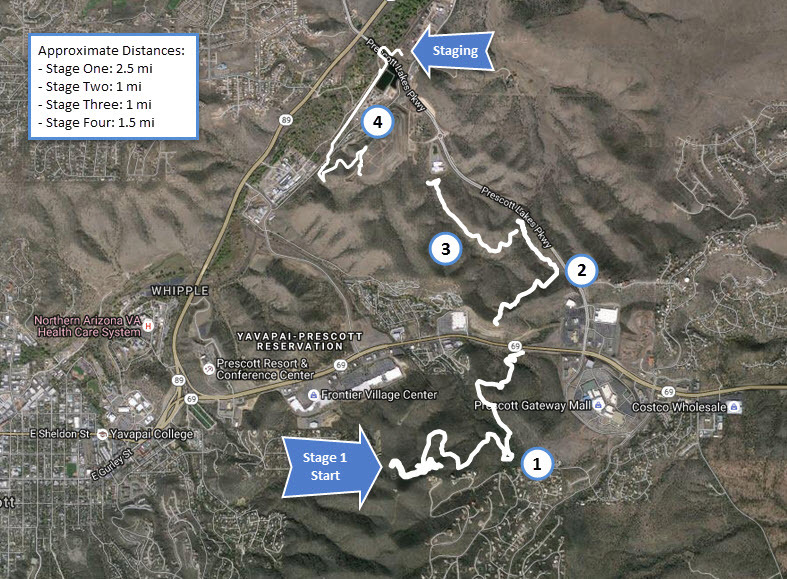 My best guess is that the last segment of the course will take you as far up to PCT (Prescott Circle Trail) Badger/P-Mountain and Chisholm trail dirt road. Just a guess. .
Coordinates That dowhnill section of the PCT is super fun. Especially from P-mountain down to 69 underpass. Regardless, Peavine up to Turley is hot one. Bring your SPF 10²⁴ sunblock if it's not rainy that day. Hint: just before the detention center, there's an off-camber spot on the PCT that does its best to spit you off the trail to the left with any kind of downhill speed. You'll know the spot from the skid marks of riders that went off. The penalty for going off shouldn't be too severe however. Go make it happen! More bike options are a beutiful thing. An enduro race is much closer to what you want, compared to any other AZ race, except for the MBAA Super D. Much respect to the folks that are championing this. Is Prescott the best place in AZ for an enduro race? It may be the best available place. This is MBAA's first enduro and they are pulling it off pretty quick! If you have any interest in enduro mtb racing in AZ, you should try to attend this to at least show support for the format. I spoke to them about the race and plans. Yes, this one is not very tech, but there are 4 timed down hills. How fast can you go? There are also plans for more tech locations and courses. Also, Prescott can offer some great enduro courses. Any idea how much vertical drop each segment would be? I'm definitely interested. You're probably right. But it would be awesome to see one staged on Mt. Lemmon some day. These grassroots organizations like MBAA, the Flaggpole crew and TORCA are the path toward making them happen, support them when possible. Apologies to all the others I left out. Only if it's at the Dells. TORCA is hosting a Funduro on Mt Lemon on October 22nd or 23rd. I would love to do it, but already booked that weekend. Look up TORCA Pechanga 2016. I know there is more info on FB. Scotth72, Enduro sections do not have to be all tech/gnar. Dells would be cool for sure though. Sugarhigh. Thanks for the plug. This is indeed true. We'll be doing the Funduro on October 23rd and it will be down the Molino section of AZT and on down through Milagrosa. There will be at least three stages and it will be as tech as you could hope for. What's more is the cost is peanuts when you consider it's part of the Pachanga which includes, fun social rides, 2017 Demos from 9 manufacturers and counting, food, and camping all in one price!! Check out torca.org or our facebook events page for details! Don't miss this! The timed downhill sections are on Badger Mtn and Sundog trails. 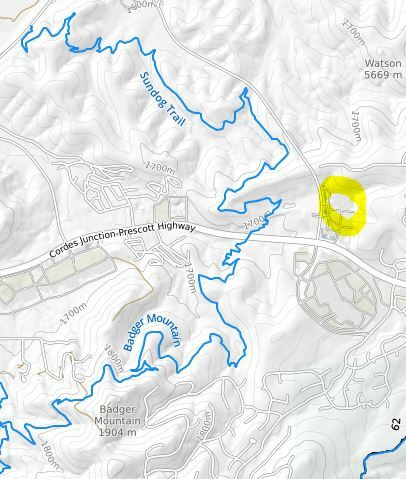 You can park near the middle of both trails at the Walmart (highlighted in pic) off of AZ-69 and Prescott Lakes Pkwy. I'll be out there tomorrow as well. Not sure how much rain the area got but I'm betting the dirt is gunna be primo. How does this work? I see that there are 4 intervals. Do you ride a loop but are only timed on the downhill sections? The MBAA doesn't have a map of the route and distance. Sorry, interested new guy. From the murmurings I've heard, I think you nailed it. Ride a loop, get timed on those 4 descents. Hopefully someone else can chime in. Safe to say advanced descending skills are needed? Not if the downhills are on badger mountain and sundog. ^LOL. Jayem, I see you in the Sus forum often, are you also located in the valley? Nope, lived in Prescott for 11yrs, rode trails described above a year ago. Very familiar with the Prescott trail system. Oh, then I suppose you can recommend which fvcking Avalanche tune these unadvanced downhill sections may require? I've also made Mrwhlr cry, so there's that too. Which avalanche tune is recommended for this enduro race? ^which color fanny pack is the better question. on P-Mtn? Gotta be Pink or Purple!! have they released the timed segments yet? I'll be there helping out with starts or wherever needed. For those that make it up. Please take pictures of the XC riders on the podium in their full roadie kits for the rest of us to see. KOM and QOM on those segments will probably win the race. I forsee an Olympian with the big W in the women's top class. Let me know when MBAA fires up a true Enduro. Wow, I guess you can tell us when you'll be hosting a "real" Enduro. Better than most, not as good as some. I thought enduro was for washed up/flunkie DH riders? I'm so confused....I was just starting to figure out the difference between trail and All-Mountain? FWIW: ski's in the late 90's went through an All Mountain branding phase as well...until folks got wise and realized that everyone ski's the entire mountain unless you're a park rat. Who's up for shuttling Schultz tomorrow? I've got gas money!!!! I'm heading up tomorrow to ride some then helping out with the race on Saturday. I'll be a timer or assistant, not sure exactly what but I'll be there for the fun and help out so all the others can have a good time. Correct me if I'm wrong, but it looks like the average grade for these descents is -4%? If true, Justin has a point. Not all courses are the same. Hats off to the MBAA and those involved for making this happen! We're headed up to race and promote the "Funduro" which will be held during the TORCA Pachanga on October 23rd on some *****in Enduro terrain. Become a TORCA member! We'd love to have the MBAA involved and perhaps we can work together as we have a solid relationship with the FS. Thanks for making this happen MBAA. ^^^^I'm ashamed for being sarcastic....peeps who work hard to get things going have my respect....even if its fluorescent. We all benefit from this....regardless of how or what we ride. Shame but it was canceled due to rain, it never really stopped and they didn't want to destroy the trails. I believe it was a good call to reschedule the event and worked out for me since I had a bad hangover. a few of us headed down the BCT K-mine sections and had a good ride. Sounds like when I tried to ride those trails last October. It just kept raining harder and harder the further I went. Totally demoralizing. Today was the race. Rained out last time I guess. I saw a picture of a carbon hardtail with 100mm travel next to the podium. And the Olympian won the gold. Congrats to the winners. Thank you MBAA for taking your first stab at Enduro. Let us know when it gets steep enough to wear pads and a full face so the gnar guys will participate. Yes the course was not very techy at all, but I still had a good time and everyone else seemed to be having fun also. I took first place in amateur men's out of 60 plus riders on a santa cruz hightower. So not every class was won by xc riders in full roadie kits. I hope there is more races next year and some with a bit more tech. I was working the start at Stage 3. Seemed like everyone was having fun. Great weather this go around. I counted 121 people through the stage. Not the most technical, but still a fun trail to ride! I wish I could have made it. I made the drive for the rain out, but the schedule would not allow this time. MBAA hinted that there will be more and the tech factor will be increased. MBAA does a real good job organizing XC races for year. I am sure they are going to pull off some great events in the enduro format. Thank you Geoff and all the other volunteers.